Here you will find an overview of our Steady Rest Types. You can download this info as PDF Document also. 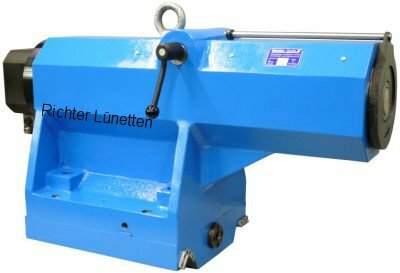 Suitable for workpieces ranging from Ø 4 to 450 mm and loads up to 5 tons. 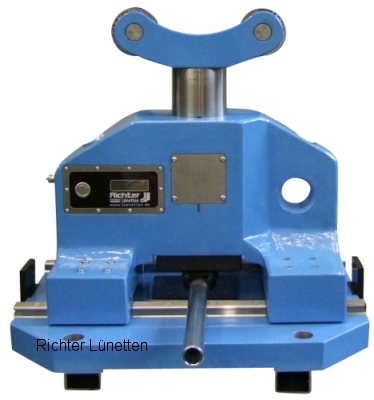 The smallest steady rest is suitable for diameters ranging from Ø 4 to 100 mm. 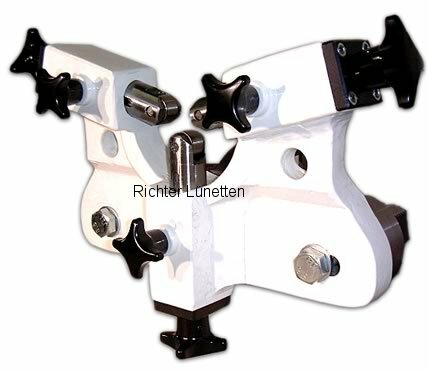 For workpiece with more than Ø 300 mm and Ø 70 mm quills and above we can fit the steady rest with a gas spring for easier opening and closing operation. 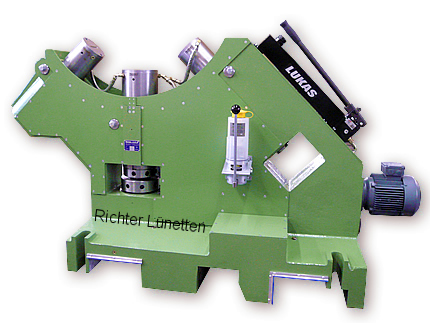 Suitable for workpiece diameters from 400 to 1,500 mm and loads up to 30 tons. Steady rests with removable top are available with three or four quills, depending upon the application. The top has to be lifted with a crane. 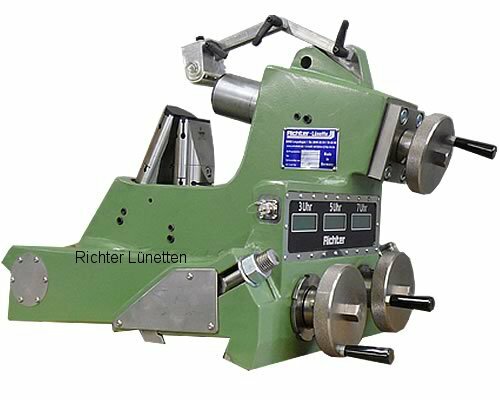 Suitable for workpiece diameters ranging from 400 to 1,200 mm and loads up to 30 tons. Steady rests with a swiveling top are designed for processes, for which the standstill time of the machine must be kept to minimum. Since the top can easily moved by hand, no crane is needed even for bigger steady rests. This considerably reduces the set-up time for a new application! This steady rest is only available with three quills. The travelling steady rest is fixed on the slide. It facilitates e.g. continuous processing and thread cutting of long shafts or spindles. These rests absorb the pressure directly on the tool at the time of chip removal. They are particularly needed for long thin shafts. 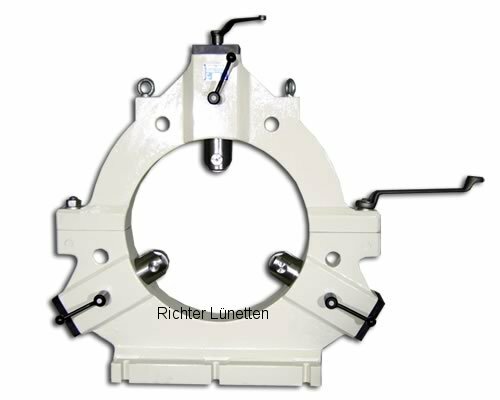 Suitable for tools with a diameter of up to Ø 400 mm. Seldom suitable for higher diameters. Available as a sliding or rolling steady rest. The C-Form steady rest has an open structure and is also used with several additional steady rests one after the other. Thus, very long and thin shafts can be processed, since they are well-protected against bending. The C-Form will also be used in CNC-lathes. With its open design it gives the other tools more room for operation. C-form steady rests are designed for loads up to the two-digit tons range. The support can run along on a second slide bed. This type of steady rest combines the features of a traveling steady rest and a stationary steady rest. 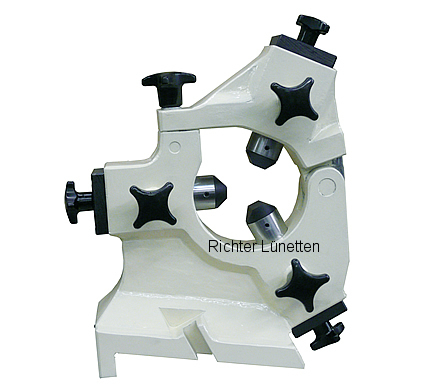 In grinding steady rests, different materials are used for gliding instead of rollers to facilitate tool contact. These are: White metal, bronze, Pertinax, special types of plastic or hard metal. Grinding also takes place in the center of a special steady rest, whereby a true running of up to 2µ is achieved! These steady rests are suitable for loads up to the two-digit ton range. Grinding Steady Rests can also build with closed design. This is available with three or four quills, depending upon the application. 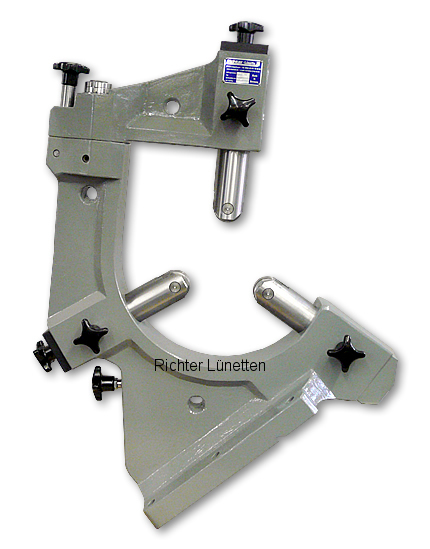 The open steady rest 7-1 shown here is used on a two revolver Okuma Machine. It is suitable for small batches and can be put into operation within a few minutes. The clamping range of this steady rest extends up to Ø 100 mm. Roller steady rests do not have an upper quill. They are build for workpieces up into the double-digit tons range and diameters up to three meters. They are used to avoid the sagging of long workpieces such as marine shafts for example. Often they will be used in combination with ordinary steady rests at the machining position. 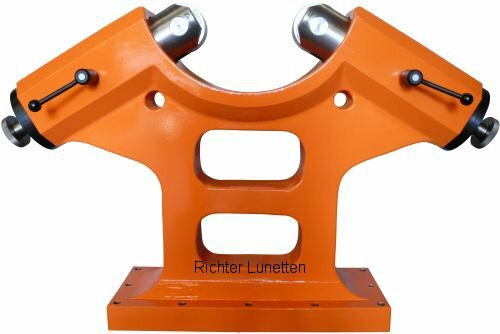 This type of roller steady rest will be used at machines with limited center height relative to work piece diameter. In stead of quills, the rollers will be held by slides operated by one or two lead screws. To archive a wide diameter range, in some cases you are able to interchange slides with different heights. In manufacturing, maintenance and repair of generators and turbine rotors at the heavy duty turning machine you have to support heavy loads. The permanent oil flow from the center of all quills ensures a safe and non damaging operation. The oil flow is recovered, filtered and recycled internally to be used again. 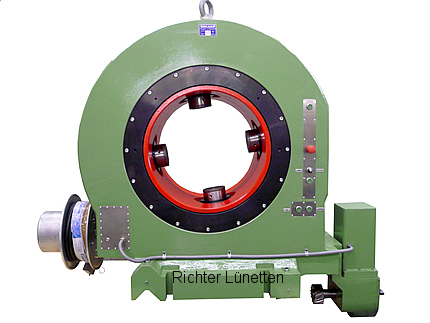 A pair of these steady rests already in use, has a capacity of up to 100 tons. The floating roller block was developed especial for the crank shaft industry. It carrys the work piece at its original crank bearings, while inspected in the quality department. 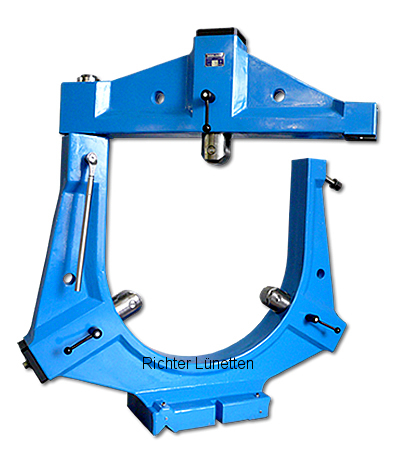 Therefore it is additional equipped with linear bearings in the base to compensate alignment errors. 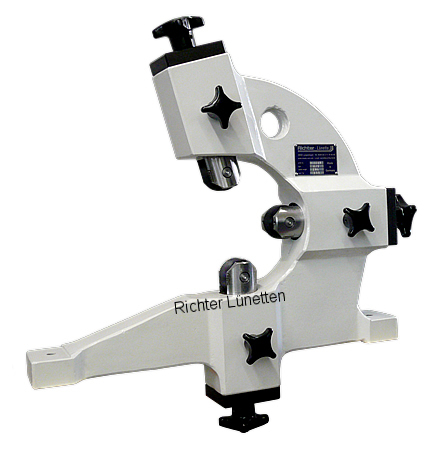 Ring steady rests are meant for long thin and crude work pieces. 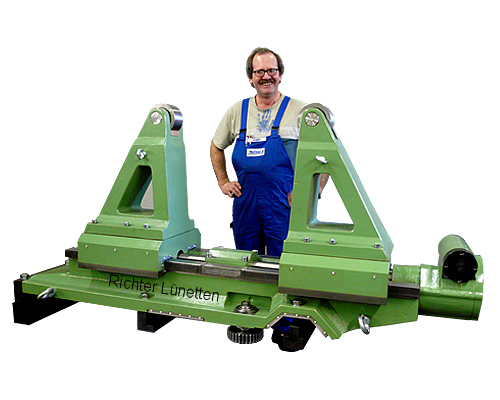 With these steady rests, bends or distortions can be worked upon to produce straight workpieces quickly. You clamp the quills directly to the work pieces without the need of a true running steady rest seat. Quills and Workpiece will rotate together in the ball bearing of the inner ring with high true run. 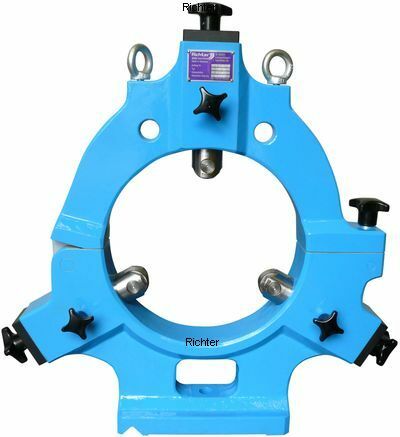 This is a tremendous time saving feature of ring steady rests making it most profitable. 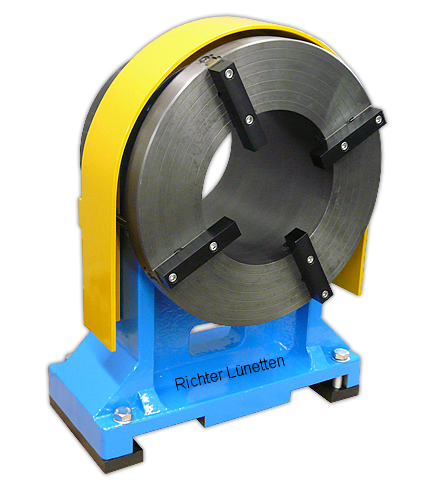 For smaller work piece loads we also offer a ring steady rest with integrated surface plate. With this device the set-up time is reduced because of the easy access of the jaws as opposed to Type 9-1. During operation, the yellow cover protects the worker from the rotating parts. For clamping irregular structures or delicate parts like plastic tubes we offer individual designed top jaws. A tailstock is the counterpart of the lathe chuck or a circular table. We build manual and hydraulic tailstocks for all kind of applications up to quill diameters of 200 mm and Morse Taper 7.